Please note: This course is offered in an online format and will not meet at CDS but will instead take place in regularly scheduled virtual sessions. Douglas Vuncannon is a visual artist, composer, freelance photographer, and writer. His short documentary films have screened at numerous film festivals in the United States and Canada. 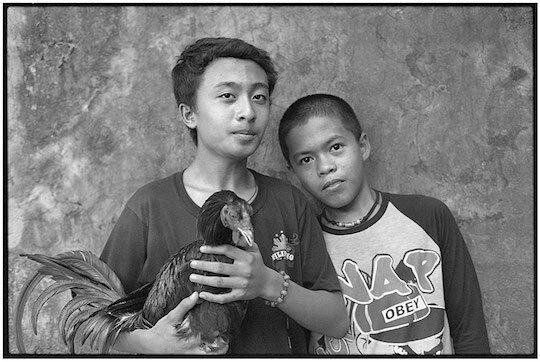 Vuncannon's recent projects include Fukushima Travelogue (2015), which consists of writings and photographs from the radioactive ghost towns of Japan, and Sabungeros (Cockfighters) (2017), a series of photographs from the Philippines that was exhibited at Through This Lens in downtown Durham in February and March of 2017. On October 6th, 2017, his Sinfonietta Fukushima, a one-movement satirical tone poem, had its world premiere in Sydney, Australia, performed by the sixty-piece Sydney Contemporary Orchestra. A late-model computer, fast internet connection, and built-in camera are recommended, though not required. Students with less than optimal hardware or internet connections are welcome to take the course, though it may be difficult to participate fully. There will be no class on May 15. All photographs, texts, videos, and other artworks appearing on this website are copyright by the artists.